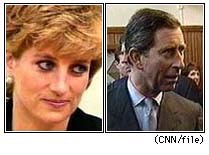 NEW YORK (CNN) -- Details of an alleged Irish Republican Army plot to kill Prince Charles and his new bride Princess Diana at a rock concert in 1983 were reported by The New York Times Friday. According to the newspaper, the attempt failed when an informer betrayed the IRA. Former IRA operative Sean O'Callaghan -- who was also an informer for the Irish police special branch and British intelligence -- told the newspaper he was ordered to kill the royal couple at a London concert. The assassination plan failed, among other reasons, because of O'Callaghan's betrayal. Just three years earlier, the IRA had killed Earl Mountbatten, Prince Charles' uncle. In 1988, O'Callaghan turned himself in to British authorities and pleaded guilty to 42 crimes. He was released from prison December 6 under what the Times said was a rarely used procedure requiring approval of the queen. Over the past two weeks, O'Callaghan has said he is ashamed about what he did for the IRA and has urged Britons not to believe Sein Fein peacemaking attempts, the Times reported. John Hume, the mainstream Roman Catholic leader in Northern Ireland for Sein Fein's participation in peace talks, has been angered by O'Callaghan's comments. O'Callaghan's account of his career could not be independently collaborated. O'Callaghan said after discovering the Prince and Princess of Wales would attend a Duran Duran concert on July 20, 1983, he was sent to London and given delayed timing detonators and 25 pounds (11 kilograms) of a powerful mining explosive called Frangex gelignite. He checked out the theater and found a spot in the wall of a bathroom near the royal box where the bomb would fit. He also learned the time when cleaning women opened the restroom, giving him the two hours he needed to plant the bomb. "It would have worked. It had a high chance of success," O'Callaghan was quoted as telling the Times in an interview in London. As the date for the concert got closer, O'Callaghan told his Irish police handlers and British MI5 officials that he needed a way to sabotage the effort without compromising his cover. Under the plan, Scotland Yard leaked a story to the London newspapers that O'Callaghan was wanted in connection with a plot to kill a member of then Prime Minister Margaret Thatcher's government. The Times said O'Callaghan had already slipped out of England for France when the stories appeared, and it was too late to find a substitute bomber to assassinate the royal couple, who were divorced this year. 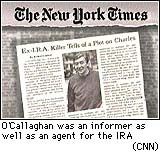 The Times said O'Callaghan had helped jail about 50 IRA operatives and confiscated millions of dollars in firearms. O'Callaghan told the Times he's an "agnostic" on the future of Northern Ireland. "I'm neither a nationalist nor a unionist," he said. "I just want people in the North to be able to decide what they want without being pushed into a corner, without being threatened."